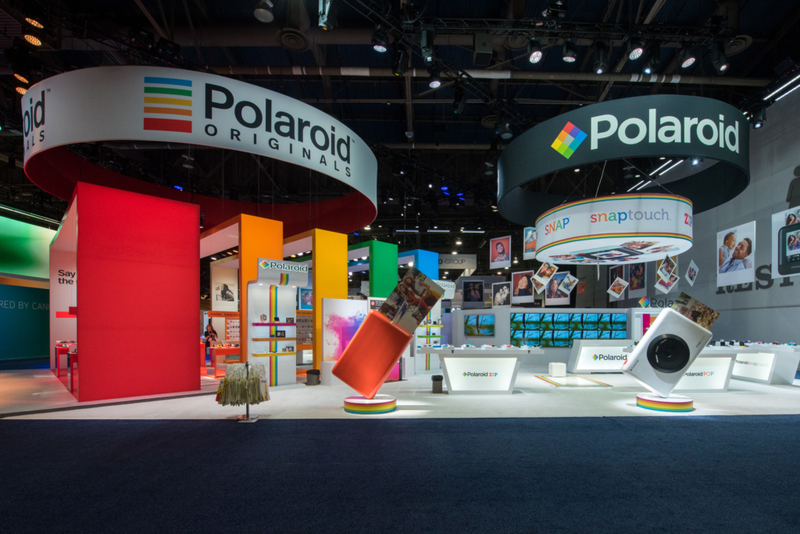 Client Spotlight: Polaroid Instant Print Category at CES 2018 | Absolute Exhibits, Inc.
After 50 years, the Consumer Electronics Show (CES) has evolved into the world’s largest gathering of consumer technologies. With over 184,000 attendees, CES has become a proving ground for innovators and breakthrough technologies. In addition, it has also become the perfect place to unveil new products to eager consumers. CES features massive halls dedicated to over 3,900 exhibitors in product categories. These categories include the Internet of things (IOT), wearable technology, automotive, health and wellness, artificial intelligence, augmented reality, and more. 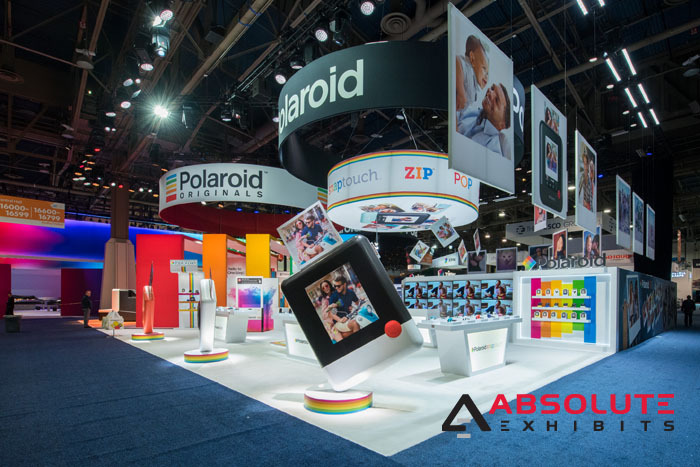 Polaroid Instant Print Category partnered with Absolute Exhibits to design a 7,200 square foot interactive custom exhibit that brought to life the modern capabilities and nostalgic fun that is central to their brand. 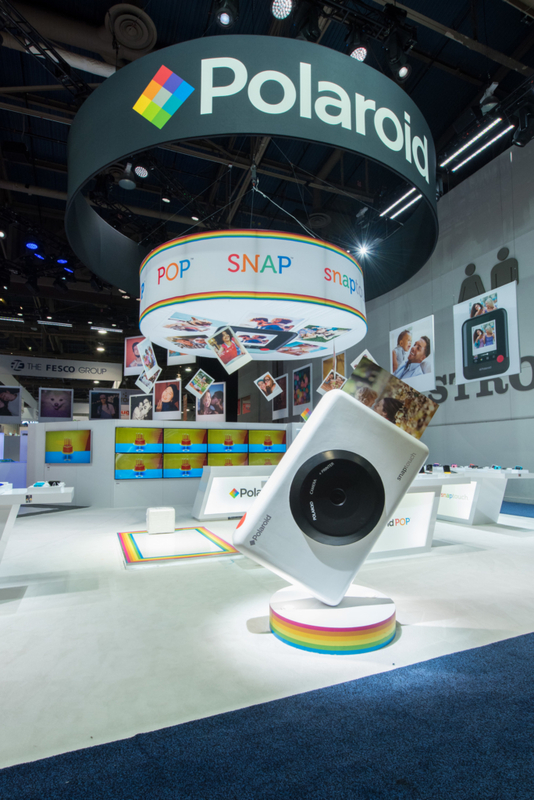 After years of exhibiting at CES, Polaroid wanted to insert a spirit of fun into its custom exhibit to show off an array of new products. Founded in 1926, Polaroid is an iconic brand that has come to embody both the nostalgia of instant analog camera as well as modern instant digital cameras. Originally, Polaroid allowed consumers to view their photos instantly when developing film often took days. However, in the digital age, Polaroid has stepped in to develop a solution for those who no longer take the time to print out their photos- their instant print category. Absolute Exhibits was challenged to blend modernity with nostalgia in a seamless open footprint custom exhibit for Polaroid Instant Print Category. Absolute Exhibits built a fully custom exhibit, which featured custom larger than life 3D camera props mounted on pedestals framing the exhibit space. As a focal point, a 2 tiered double-sided fabric hanging sign announced the brand and its products overhead in this custom exhibit. Beneath the sign, custom printing further displayed Polaroid products. And surrounding the booth, multiple double-sided semi gloss hanging signs also displayed photography and products in a colorful and fun way. The open footprint design included custom backlit counters to allow consumers the opportunity to test Polaroid products. A custom built kiosk with arches allowed for a greater depth of experience with Polaroid products. Additionally, we added custom backlit shelving adjacent to an LED video wall. And finally, Polaroid offered consumers the ability to paint one of their staff at this custom exhibit. Altogether, these features gave this custom exhibit a colorful and bright space for consumers to enjoy Polaroid’s products. 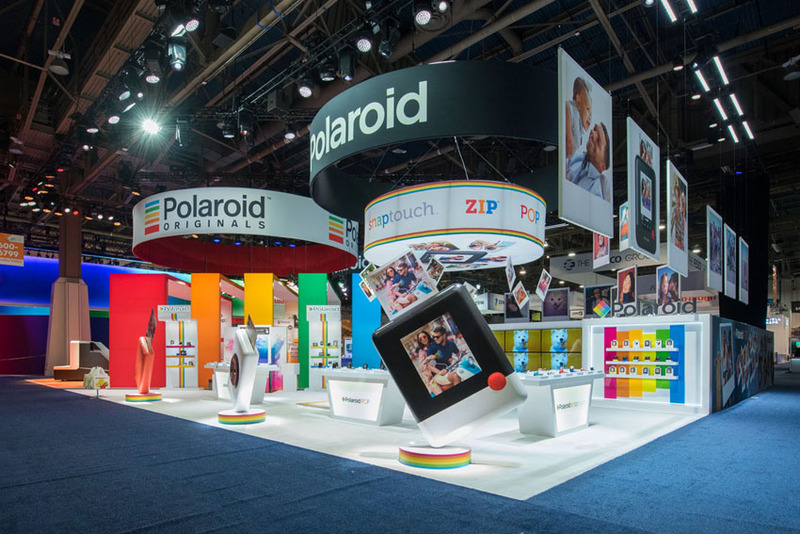 “Our team was very proud to bring Polaroid’s vision to life on the trade show floor. Working with Michelle on the details was a joy. As the creative process progressed, we became more excited about the concept of blending nostalgia with modernity. We thought it turned out fantastic and look forward to working with the team again,” said Kyle Moeller, Absolute Exhibits Account Executive. The Polaroid Instant Print Category custom exhibit at CES was a massive success. Because the booth was so interactive and colorful, Polaroid delighted thousands of attendees and drew significant press. “I actually look forward to working with the Absolute Team. They are an ‘On Demand’ Company” said Senior Director, Trade Shows and Events, Michelle Winfrey.